The iron box is five centuries old and thick with rust, but the secret it contains still smells faintly of the wetness of blood. Two men have come to the coven, once more to ignite the embers of treachery that have concealed it. Both are driven, one by a lust for wealth, and the other by his passion for the outsider god. In the long-awaited sequel to Coven, Elspet returns to the magic of her birthright and desperately seeks the truth behind the madness that has befallen her. Legacy was my first genuine sequel. It formed a much belated second chapter to Coven, my first novel. 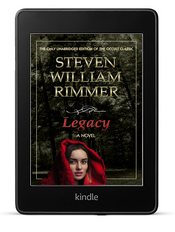 Coven, and hence Legacy, are set in a coven of witches who dwell in a secluded valley in Wales, largely forgotten by the world. I hasten to point out that none of them wear pointy hats or display bumper-stickers that read “my other car is a broom.” Bereft of Hollywood and a few hundred years of christian propaganda, witches are people who worship the old fertility gods, and seek to understand the ways of the land. The word “witch” is from the middle English “wycc,” which means “to bend.” It survives today in the word “wicker,” which means “cheap furniture you dare not sit on.” Witches were thought to be able to bend nature to their wills — which well they might have done, when no one was watching. Legacy, like Coven to some extent, is about corruption. The witches have something that a shadowy character from beyond the coven appears to want, and some of their number have been persuaded to have a look ’round for it. Sufficiently persuaded, they eventually turn to murdering a few of their own to facilitate their search — it’s surprising how persuasive an American Express card can be amongst people who’ve never seen bottled milk. I’ve been surprised at how well Legacy’s sold since its release in 2006 — especially considering that the book it’s a sequel to was originally published two decades earlier. Out of necessity, it’s very much a self-standing novel — a great many of the readers of it who’ve sent e-mail about it hadn’t read Coven, and didn’t seem to be at much of a disadvantage in confronting Legacy. 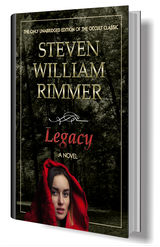 Elements of the cover graphic for Legacy are used under license from StockFresh.